There are a number of great menu-bar clocks and calendars for Mac OS X, making it easy to customize the display of the date and time in the menu bar; many also provide a handy drop-down calendar. But the major limitation of most is that they don’t show me my actual schedule—I’d like to be able to see what I have planned without launching my calendar program. And on the few that do offer this feature, most require that I enter that schedule information into the calendar manually—a hassle considering that I’ve probably already entered it into my “real” calendar. ObjectPark Software provides convenient solutions for users of Apple’s iCal and Microsoft’s Entourage via MenuCalendarClock for iCal 2.0.9 ( ) and MenuCalendarClock for Entourage 2.1.0 ( ), respectively; the applications are $19 each, or free for use of basic features. For the most part, the two versions of MenuCalendarClock work identically; the main difference is in the calendar each accesses to display your schedule: iCal or Entourage. When launched, the date and time appears in the menu bar in the format you determine via the app’s preferences; I’ve chosen to display the hours and minutes along with a small calendar showing the date. (You’ll likely want to disable OS X’s own time/date display via the Date & Time pane of System Preferences.) You can also change the font, style, and color and force MenuCalendarClock’s display to be positioned to the right of Apple’s menu extras (except for Spotlight). If you click on the date/time display in the menu bar, an actual calendar drops down; you navigate between months using the left/right arrow buttons, as with most calendar apps. (I wish you could view multiple months simultaneously, as you can with You Software’s You Control.) But what sets MenuCalendarClock apart is that it automatically displays your actual iCal or Entourage calendar events. 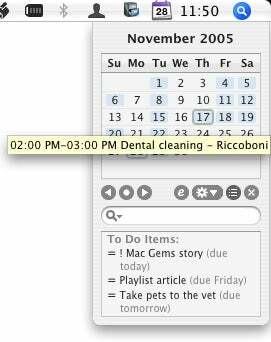 Days that include such events are highlighted; mouse over a highlighted day and a tooltip appears displaying that day’s events. If you actually click on a day, that day’s events are displayed at the bottom of the calendar display along with more detailed information, including colored boxes that represent each event’s category in your actual calendar—work, personal, etc. You can also choose to display your iCal or Entourage to-do list; my only complaint about this feature is that, as the screenshot above shows, items are listed in alphabetical order rather than “to do” order. MenuCalendarClock automatically checks your iCal or Entourage calendar for changes at an interval you determine: every 2, 20, or 60 minutes, or once per day. You can also check for updates manually. Why would you not want the program to check frequently? Because doing so is slow and takes a lot of processing power—you’ll likely notice your Mac slow down a bit during the sync. Both versions of MenuCalendarClock offer numerous options for customizing the calendar display. For example, you can choose to display events and tasks only from particular calendars (iCal) or categories (Entourage). 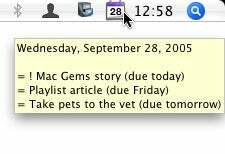 And one of my favorite options is the menu-bar tooltip that displays today’s events and tasks without having to view the drop-down calendar—you simply move the mouse cursor over the MenuCalendarClock icon in the menu bar to see everything you need to do today. Finally, the iCal version of MenuCalendarClock has one additional feature: It can automatically import all of the birthday information from Address Book into an iCal calendar. For those using Tiger, this isn’t a big deal, since iCal can do this on its own, but Panther users will appreciate the feature. Unfortunately, if—like me—you use both iCal and Entourage, you’ll be disappointed to find that you can’t run both versions of MenuCalendarClock at the same time. Not to mention that you’d have to buy both versions; it would be nice if there was a single version that lets you choose to work with Entourage or iCal (or both). But I suspect that most people use only one of the two, so they won’t mind this limitation. If you’d like quick access to your calendar, and use iCal or Entourage, MenuCalendarClock will be a useful addition to your menu bar.